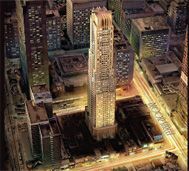 The Uptown Residences is an impressive 48 storey, traditional art deco style tower set just off Yorkville on a quiet street. This structure was a theatre and vaudeville center in the 1920s and features an exterior of glass and precast with a granite entrance. Luxurious living is the mood with laminate hardwood floors in the dining and living rooms, extra tall European styled cabinets, granite countertops in gourmet kitchens, upgraded stainless appliances, and some suites display 10 and 11 foot ceilings. Additional features are the deep soaker tubs, granite counters, and under-mounted sinks in the bathrooms. A completely equipped fitness room, aerobics and yoga room, multi-station gym, steam rooms, and separated men and women changing rooms are all part of the Uptown Club. Almost all of the suites have a terrace or balcony. Amenities are many and include The Metropolitan Lounge with it’s semi-circular bar, lush seating, and kitchenette. If golf is your love, make the most of the Virtual Golf Room, or enjoy the Multi-Media Theatre Lounge for a night at the movies. For relaxation, spend time experiencing the smells of the terraced garden patio or the sight of the breathtaking view of Yorkville.